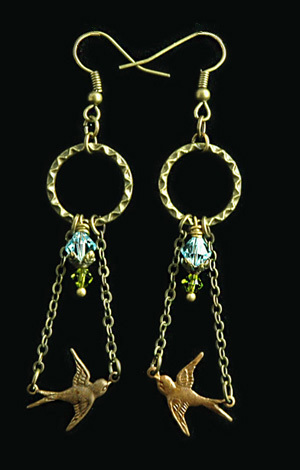 A delicate Swallow sways in the breeze suspended from tiny antiqued gold brass chain. A beautiful Swarovski Tanzanite crystal bead and tiny Peridot colored crystal add a touch of sparkle to these lovely earrings. All are suspended from a beautifully etched antiqued gold brass hoop.